With Capt. Steven Lamp - Key West Fly Fishing Guide. Fly Fishing for permit is probably the most challenging form of fly fishing that there is. The accomplished angler needs to have a tremendous double haul, nerves of steel, and eyes of a hawk. He must be able to go from "fly in hand" to 40 - 80 ft. in less than 3 false casts. Great line management is a must as well as an understanding where the fly is in relation to the permit after the the cast. The hardest part of this is not the actual fight of the Permit, although very thrilling, it's the presentation of the cast that will make you or break you. One of my favorite fish to fish for is the Key West Permit. I made a career out of challenging myself and my anglers hunting for permit day in and day out. Permit near Key West range in sizes from 8 - 50 lbs. offering all the lure of big game hunting and the challenges of the toughest Casts. The strike is very subtle and the runs are never ending. Just when you think a permit is done they take off again. There is no doubt about it. Permit are finicky and evasive. When Booking a day Fly fishing for permit with me I will assume that your skill level is advanced. If the conditions are windy we will still be going out (within reason). Please review my booking policies for you information and my Rates Page for pricing structure information. I offer 4, 6, and 8 hour fly fishing for tarpon charters on board either my flats boat or my yellowfin bay boats. (most prefer the flats boat). The cost is the same. Best times for departure are when the sun is shining. I will need to know a few things. Will you be bringing your own gear? If not Then I will need to know if you are Left or right handed? Will you retrieve with left or right hand? What is your experience in fly fishing? Are you able to cast accurately in some winds? Can you double haul? Fishing is supposed to be fun. If fly fishing gets you aggravated let me know and I will share with you the phone numbers of many talented fly fishing guides that enjoy fishing with grumpy fly fishermen. Personally I am not into it. I like for my clients to enjoy the day and leave the stress at the dock. 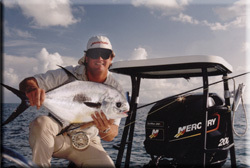 Fly Fishing for Permit in Key West and the Marquesas Keys is great all months of the year except late April and early May, this is when they head out to the reef line to do the spawn and there are fewer fish found on the flats. No worries though Key West Fly fishing for Tarpon is in full swing and they will entertain you. The rest of the year is lighter and stronger only due to celestial patterns, tides and cold fronts. Permit are little effected by heat or cold, I have caught fish in 60 degree water and in 88 degree water. If there was a best water temp I would guess it to be roughly 78-85.